Blanchard Mountain will be in the crosshairs again on Tuesday, October 26, at an unadvertised public meeting in Skagit County hosted by the DNR (see meeting details below). The DNR has appointed a new committee to make recommendations on logging and new road construction in 2011 and 2012, as well as the creation of a small Natural Resources Conservation Area (NRCA). The new committee is similar to the original one in that the public is once again being largely excluded from the process. When public comments received by the DNR objected overwhelmingly to the 2007 logging plan, the DNR pointed to its ad hoc committee and said this committee is our "public," not the citizens. They held a "public information meeting" and dutifully invited public comment. Unfortunately, the DNR ignored every comment they received--and we are not exaggerating here--every comment from the hundreds of citizens who opposed the management strategies. Not a single word was changed in the committee's draft proposal. The DNR appointed a second ad hoc committee this summer that met for the first time in late September. All but one committee member supported rubber-stamping the DNR's plan to expedite logging on the mountain. The DNR told the group that the public has already had its say in the matter and that their job is to implement the strategies, not question them. As you know, that draft was approved by the DNR in August 2007 and the Chuckanut Conservancy immediately filed suit, which is still moving through the courts. The new committee held its first meeting in late September and agreed to support logging across two-thirds of the mountain. So we now have a DNR logging plan that the public does not support being implemented by a committee that does not represent the public. One October 26th, the committee will be asked to rubberstamp the DNR's plan for its first two timber sales, one of which borders the Pacific Northwest National Scenic Trail for a full half-mile. You are welcome to attend this meeting. If not, you can express your concern directly to Commissioner of Public Lands Peter Goldmark (cpl@dnr.wa.gov). Tell him it's time the public's voice was heard and that much more needs to be done to protect the mountain. We appreciate his proposal to establish a new NRCA, but it is simply too small to provide the level of protection this special place deserves. For those who can get away on a work day, the meeting will be held from 8:30 am to 3:00 pm at the Bay Ridge Fire Station, 16220 Peterson Road. If you can only attend part of the meeting, try to be there by 12:30, which is the end of their lunch break. Directions - From I-5 exit 231, head west on Josh Wilson Road to Avon Allen Road; turn left, then follow this to Peterson Road and turn right. The fire station will be a mile ahead on the left. Thank you. Help us Defend our Lower Court Victory... see below. Commissioner Goldmarks's proposal for a new Blanchard Mountain NRCA is a great concept, but misses the mark.. The fight continues for real protection of the mountain. In late February 2010, Commissioner of Public Lands Peter Goldmark announced his proposal to create a Blanchard Mountain Natural Resources Conservation Area, or NRCA, which would improve protection of the 1,600-acre "core area" established under the agency's 2007 management plan. While we have always supported the concept of an NRCA ("core area" is a vague term full of loopholes), the central issue at hand--the size and location of the NRCA--has not been addressed. In short, the commissioner's proposed NRCA is simply too small. In the press release announcing the NRCA, the commissioner acknowledges the mountain's "amazing recreation opportunities, rich wildlife habitat and sweeping views" and implies that the NRCA is somehow going to protect those values "for generations to come." Unfortunately, the reality on the ground is that those values will be directly harmed across large areas of the mountain if the commissioner is not willing to expand the proposal. The 1,600-acre figure was arbitrarily established by Goldmark's predecessor, Mr. Sutherland, and has never been justified to the public. No science backs it up. No studies on the ground were conducted in order to establish the acreage or the boundaries. The DNR's maps were prone to errors. And the agency continues to exclude many interest groups and the public at large from its decision-making process. We're still awaiting a decision on the DNR's appeal of our lower court victory in July 2008. Although a preliminary decision was issued earlier this year, parties on both sides of the issue objected to some of the language. The court asked for additional information and has yet to issue a final ruling. News will be posted here once the decision is released. Background on the lawsuit is provided below--and yes, we still need your help! Please donate today. Many of us thought that when we elected a new Commissioner of Public Lands, one who promised change, that things would, well, change. Unfortunately, except for the latest twist for an NRCA, not much has changed at Blanchard Mountain, so the fight goes on to save this beautiful place. The long battle over Blanchard Mountain is described in detail below, but in a nutshell, here's where things stand currently. After many years of controversy, the former lands commissioner, in 2006, appointed an ad-hoc advisory group to look at the issues and recommend a solution. Regrettably, many interests and stakeholders were not invited to the table and the advisory group came down strongly in favor of logging most of the mountain. Of the 4,800+ acres at issue, a 1,600-acre core area would be set aside and the rest would be logged, beginning almost immediately. In our view, the core area boundaries made little sense on the ground, were not based on any kind of scientific analysis, and simply fell well short of providing the kind of protection that is needed at Blanchard Mountain. Miles of popular trails would be logged, including major sections of the Pacific Northwest National Scenic Trail and at least the first mile of the Lily and Lizard Lakes Trail, which today is one of the prettiest forest walks in the entire Chuckanut Range. If you have hiked the Oyster Dome Trail recently, you may have noticed the flagging just up the hill from the trail. That is approximately where the DNR wants to begin logging, thus even the single trail on the mountain that the plan purports to protect (from end to end) will be seriously degraded. The plan also lacks a protected wildlife corridor between the wild heart of Blanchard Mountain and Larrabee State Park nearby. Even the core area itself would be open to some limited logging and road construction. The logging plan, if carried out, would fragment the largest remaining roadless area on the shores of greater Puget Sound. The ad-hoc group's recommendations were adopted by the former commissioner in August 2007 and the Chuckanut Conservancy, joined by the North Cascades Conservation Council, immediately filed suit. We won a major court decision in July 2008 (see below) and the DNR was directed to prepare an environmental impact statement (EIS) before proceeding with its plan. Nevertheless, the former commissioner filed an appeal of the decision only weeks before leaving office. We fully expected the new commissioner (who promised change during his campaign), to work with the conservation community to significantly improve protections for the mountain. Instead, the commissioner has been spending scarce taxpayer dollars defending the appeal filed by his former adversary. While we have expressed our willingness to negotiate an amicable settlement of the lawsuit, the DNR has so far refused to engage in any real dialogue on the issues. We are "stumped" that, this far into the new commissioner's term, no progress has been made. However, we also believe that part of the problem may be in the Commissioner's reliance on too much advice from the old guard at DNR, rather than putting his own scientific credentials to work crafting meaningful solutions to the debate. A hearing on the appeal was held in early November 2009 and a decision could come at any time. If the DNR wins its appeal, the fight will continue. If the DNR loses, we can only hope they will finally be motivated to sit down and negotiate. We think there are win-win solutions available if the agency is willing to consider them. Whether we win or lose on the appeal, our legal team is fully prepared to carry on the battle. In the meantime, we need everyone who cares about this special place to contribute to our legal fund. We hope you can help. 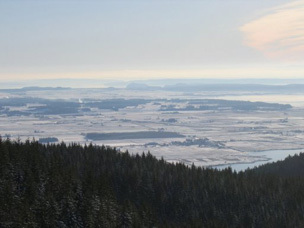 On July 8, 2008, King County Superior Court Judge Susan Craighead ruled in favor of the Chuckanut Conservancy (and co-plaintiff North Cascades Conservation Council), finding that the DNR erred when it concluded that the agency's new logging plan would have no significant environmental impact on Blanchard Mountain. The court required the DNR to begin preparing an environmental impact study (EIS) for its plan to significantly increase logging across two-thirds of the mountain. The EIS will need to look at less harmful alternatives that ensure better protection of environmental and recreation values on the mountain. The judge agreed that Blanchard Mountain is a very unique place. She wrote in her decision, "Most important, Blanchard Forest represents a slice of near-wilderness in the middle of a rapidly urbanizing area. Some 35,000 people currently use the forest for recreation annually, and that number can only be expected to grow as the area's population increases and wild places become harder to find." The fight to save Blanchard Mountain isn't over by any stretch, but this was a very important victory nonetheless. Although Washington elected a new "environmentall friendly" Commissioner of Public Lands in November 2008, former Commissioner Doug Sutherland filed a last-minute appeal of the judge's decision in December. The new Commissioner, Peter Goldmark, took office in January and still has not found a way to resolve the dispute over Blanchard's future. While the Commissioner faces many challenges in his new job, we believe it is time for him to act. We have made it clear (as have many others) that sitting down and negotiating a settlement to the lawsuit is a far more constructive path than continuing the court battle. To all those who have supported the cause, we simply wouldn't have made it this far without your help. Thank you! Read the judge's decision here. Roads and logging will impact many miles of existing trails, including the Lily and Lizard Lakes Trail, Oyster Dome Trail, the British Army Trail, Max's Shortcut, North Butte Trail, and even the Pacific Northwest Trail which officially became a National Scenic Trail in late March upon President Obama's signature. New road systems are planned high on the south, east and north flanks of the mountain, radically altering the backcountry experience currently enjoyed by tens of thousands of trail users each year. Blanchard Mountain and the Chuckanuts are the most heavily used year-round recreation destination in Northwest Washington, yet the DNR has not acknowledged the true impacts of its logging plans. For example, much has been made of viewshed protection measures included in the DNR's plan for Blanchard Mountain. Yet only the views from a limited area south of the mountain would realize any benefit. Logging and new road corridors will be visible from I-5, the Lake Samish Area, Larrabee State Park, various Whatcom County park lands, Samish Island and Samish Bay, and from within the Blanchard Mountain trail system itself. Logging will scar a significant portion of the spectacular view from Oyster Dome. Outstanding views from other high points, such as the North Butte Trail (highest trail in the Chuckanut Mountains), South Chuckanut Mountain, the Pacific Northwest Trail, and Raptor Ridge will also be impacted. Narrow trail buffers planned for some trails are inadequate to screen the logging impacts for trail users. In short, the wild and roadless backcountry experience currently offered at Blanchard Mountain will be lost to the communities that depend on the Chuckanuts as an extremely valuable regional recreation destination. Despite a wealth of "green" sounding rhetoric issued over the past year by the DNR, partial cuts and new road construction will have major impacts on this last coastal forest, disrupting major habitat corridors between Blanchard Mountain, Larrabee State Park, and nearby wildlands, while fragmenting the largest unprotected roadless area left along the coast of the greater Puget Sound region. It's no secret that Conservation Northwest of Bellingham supports the DNR's logging plan. The group believed that the small and oddly shaped protected core area provided for in the DNR's plan was the best that could be obtained. Yet almost every group and advocate who has been deeply involved in the debate over Blanchard Mountain for the past fifteen years strongly disagrees. Groups on record opposing the DNR's plan include the North Cascades Conservation Council, North Cascades Audubon Society, Sierra Club, Bellingham Mountaineers, Coast Watch Society (which facilitated the Friends of Blanchard Mountain), and of course the Chuckanut Conservancy. The point is not to single out Conservation Northwest, since they are surely entitled to their position on the issue. Blanchard Mountain aside, Conservation Northwest has certainly accomplished many great things over the years. The more critical point is this: rather than bringing everyone to the table to resolve the issues, former Commissioner Sutherland hand-picked a committee that he believed (in our view) would give him the result he was looking for. Not surprisingly, each of the groups opposing the compromise plan developed by Sutherland's committee we're carefully excluded from the process. Voices favoring expanded logging on Blanchard Mountain dominated the committee. Even good science and the expertise of numerous professionals familiar with the mountain were not consulted. Because of the damage that was about to be done and the fact that we believe the public will support a much more visionary plan for Blanchard Mountain, we joined the North Cascades Conservation Council in September 2007 as co-plaintiff in a lawsuit against the DNR to stop the implementation of this destructive plan. To date, we have enjoyed several important court victories; however, the lawsuit is ongoing and some key issues have yet to be decided. We will report on the latest developments as they occur. We have an outstanding legal team representing our case, led by attornies Dave Bricklin, Jennifer Dold and Toby Thaler of Seattle. While we have offered to discuss reasonable alternatives and settlement terms with the DNR which include assurance that the trust would be compensated as required. Nevertheless, the agency has been unwilling to discuss potential solutions to the controversy. Instead, they continue to spend our tax dollars defending what we think was an unfair public process that short-changed both recreation and conservation interests. Will the DNR continue to stand in the way of a reasonable solution that truly protects Blanchard Mountain, while also maintaining a viable working forest that generates revenue for the trust? For now, that appears to be what's taking place. We're hopeful that the new Commissioner, whose scientific credentials are outstanding, will begin to understand how political (and non-scientific) the BSG process was. It's time for a more inclusive discussion, good science and good planning. Your continued contributions to the cause are appreciated. · Blanchard Mountain is unique geologically in all of Puget Sound. It is the only place where the Cascade Mountains meet the sea. It rises 1,000 feet at 0.3 miles from the sea, and rises 2,000 feet 1 mile from the shoreline. It is the home of five mountain lakes. · Blanchard Mountain represents the largest remaining mature coastal mainland forest, including old growth, between Vancouver B.C. and Olympia: the only coastal Marbled Murrelet nesting area remaining in the Greater Puget Sound Region. · Blanchard Mountain is an invaluable component for the restoration of Puget Sound and serves a higher value as a permanently protected relic old-growth forest for all citizens and generations to experience, learn from and enjoy forever. · The BSG process was exclusive, not inclusive, of open community and scientific input. The BSG was hand selected by the previous Commissioner for Public Lands and heavily favored interests friendly to the timber industry. · There was little consideration in the BSG’s proposal for fish & wildlife and supporting habitat (for all life phases). Biodiversity was documented by an earlier study (2002) as the second highest value, but was not given sufficient consideration at the BSG. · The BSG agreement vastly underestimates the positive recreational and economic values of not logging Blanchard Mountain. More than 50,000 people are likely to use Blanchard Mountain annually, generating direct revenues into local economies (both Whatcom and Skagit counties). · Using Blanchard Mountain as a “demonstration forest for eco-logging” is a poor rationale for increased logging along the I-5 corridor and in the National Forest. Societal values are changing to favor better protection of ecological and recreational values. DNR’s mission needs to adapt accordingly. There are many thousands of acres of forest land available for harvest in Skagit County. · Contrary to public perception, the majority of timber revenues generated by logging on Blanchard Mountain do not go to the Burlington-Edison School District. In fact, the revenues generated represent less than ¼ of 1% of the school district’s annual budget. Supporting schools with timber revenue is not sustainable. · In a time of increasing concern with global warming, the primary responsibility of the DNR should be to protect Blanchard Mountain’s ecological integrity and biodiversity, as well as its carbon-sequestering value (pulling carbon dioxide out the air). · Ask DNR to impose a moratorium from logging until a comprehensive scientific assessment is completed. The BSG agreement will have direct and immediate adverse environmental consequences. · Oppose new roads on Blanchard Mountain until the scientific assessment is completed. · Permanently protect a much larger reserve area for passive recreation and habitat conservation. The 1,600 acre recommended core by the BSG is too small. It is not based on biological, ecological or recreational values, but instead is based on accessible timber. The Chuckanut Conservancy has recommended a 3,100-acre core area to be permanently protected. · The DNR needs to protect existing mature forest, other sensitive habitat, and associated corridors for preservation and restoration, including a substantial connecting corridor to Larrabee State Park. · The governor has announced a program for the environmental restoration of the Greater Puget Sound Region. If Blanchard Mountain is not logged, it will be unnecessary to expend tax payer funds to restore the damage incurred from logging. The value of Blanchard Mountain protected FOR FUTURE GENERATIONS: Priceless!! 1. No new roads should be constructed on Blanchard Mountain. 2. An area of 2,400 acres should be adopted and managed for Natural Resource Conservation Area values. 3. The northwest vicinity linking Larabee State Park and the Puget Sound Shoreline with Blanchard Mountain should be restricted from logging, and maintained in a forested state as a habitat corridor. 4. Promotion of logging on National Forest Lands, specifically in the Finney Block, is outside the scope of this agreement, and is opposed. 5. The Blanchard Forest Advisory Committee should not be appointed at the whim of DNR, as the Blanchard Strategies Group was. Otherwise DNR will be able to stack the committee with members who will provide a “rubber stamp” approval of anything DNR proposes for Blanchard Mountain timber harvest and management. This is NOT representative government. 6. Restrict logging on Blanchard to the south and eastern most areas for 5 to 10 years to allow conservationists the opportunity to assemble resources to expand the core protected area. 7. No support for “securing sustainable timber supply in Skagit or Whatcom Counties”. This is a job for the DNR, not for private citizens who want to maintain State Lands for recreational and environmental purposes.